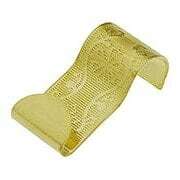 Picture rail hooks are used to hang art and photos from picture rail moldings. Simply attach the picture hook to the top of the picture rail using picture hanging cord to attach your artwork to the bottom of the hook. Use heavy duty hooks for larger art items. 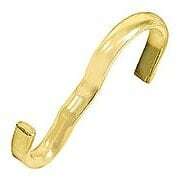 This cast brass picture rail hook is made extra thick to support your heavier hanging items. The prominent "button" is not only eye-catching, it holds the wire firmly in place. The simple design and 8 great finish options make this a popular choice for any style of home. 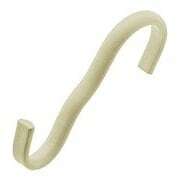 Utterly plain, yet stylishly shaped, this tapered picture rail hook works with every type of décor. 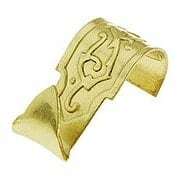 It's made of solid brass that is pressure formed for strength. Choose from 8 popular period and modern finishes. 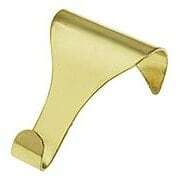 This simple Plated-Steel Picture Rail Hook is an economical way to hang your pictures in true, period style. The steel is pressure-formed for added strength. Choose from an array of popular finish options. Taking the form of a sparrow in flight, this charming cast iron picture rail hook was reproduced from a late Victorian original. In this unique design, the bird rotates to the right, allowing you to hang cord on the hook concealed below. 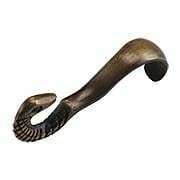 Despite its delicate appearance, this cast-iron hook it is quite sturdy and well suited to larger or heavier items. Choose from natural iron with a lacquered finish or a variety of plated/painted options. Taking the form of a sparrow in flight, this cheerfully painted picture rail hook was reproduced from an 1880s original. In this unique design, the bird rotates to the right, allowing you to hang cord on the hook concealed below. 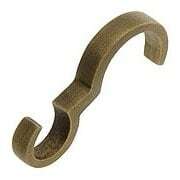 Despite its delicate appearance, this cast-iron hook it is quite sturdy and well suited to larger or heavier items. The three period color combinations add a bright splash of Victorian charm to any room. Taking the form of a sparrow in flight, this charming picture rail hook was reproduced from an 1880s original. 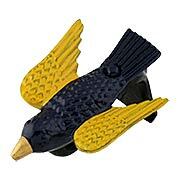 In this unique design, the bird rotates to the right, allowing you to hang cord on the hook concealed below. 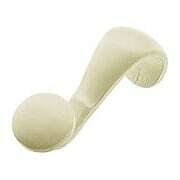 Made of cast bass, it is quite sturdy and well suited to larger or heavier items. Choose from unlacquered brass, which will age naturally, or bright lacquered brass. Taking the form of a sparrow in flight, this charming picture rail hook was reproduced from a late Victorian original. In this unique design, the bird rotates to the right, allowing you to hang cord on the hook concealed below. Made of cast bass with our exclusive antique-by-hand finish, it is quite sturdy and well suited to larger or heavier items. As the surface is not lacquered, the patina will darken gracefully with age. Despite its slight appearance, this simple Plated Picture Rail Hook is extremely strong. Made of flattened steel rod, it is a great choice for galleries or anywhere a large quantity of hooks are required. 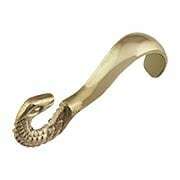 Reproduced from a circa 1850 English antique, our Large Regency Picture Hook is exquisite. Slightly oversized and made of heavy stamped brass, it is a must-have for Classical or Victorian interiors. A charming style from the 1880s inspired this lovely Victorian Floral Picture Rail Hook. The base is notched on each side to keep the cord from shifting, even when your picture is bumped! 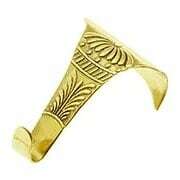 Made of solid brass, it comes in an array of classic finish options. 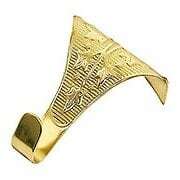 This delightful Art-Nouveau Picture Rail Hook was reproduced from a circa 1900 English original. The unusual pattern may be a feather, a curling leaf, or insect wings - we're not sure which. Regardless, the effect is lovely. 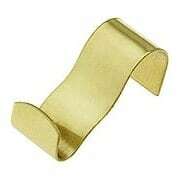 Finely cast in solid brass, this hook is strong enough for large or heavy items. Swirling vines cascade over the top of our delightful Scrolling vine Picture Moulding Hook. 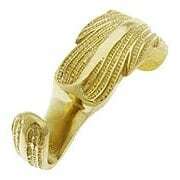 The late Victorian design is reproduced in solid-brass and pressure formed for added strength. Choose from and array of fabulous finish options. 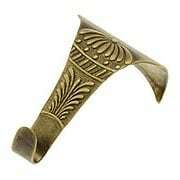 This delightful Art-Nouveau Picture Rail Hook was reproduced from a circa 1900 English original. The unusual pattern may be a feather, a curling leaf, or insect wings - we're not sure which. Regardless, the effect is lovely. 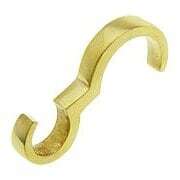 Finely cast in solid brass, this hook is strong enough for large or heavy items. Our exclusive Antique by-Hand finish ages gracefully over time into a beautiful natural patina. Simple, smooth and sturdy, our versatile Plain Picture Hanging Hook goes with any style of interior. 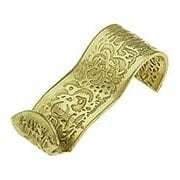 Manufactured in solid brass, it comes in an array of popular finish options. 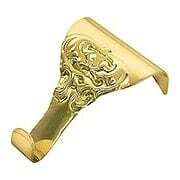 Dating from the High-Victorian era, our Neo-Baroque-Inspired Rail Hook will hold your pictures in style. 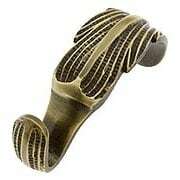 This 1880's design is reproduced in solid-brass with your choice of an array of period and modern finish options. The design of our Ornate Floral-Pattern Rail Hook dates to the late-Victorian era. 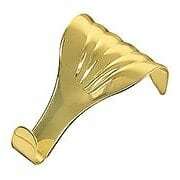 Made of thick, solid-brass, this hook is a great choice for hanging your heavier pieces. 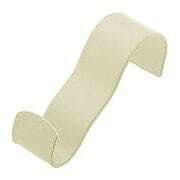 This sweetly printed Ivy Pattern Ribbon-Style Picture Rail Hook is as pretty as a snippet of grosgrain ribbon. Its subtle bands of ivy add a lightly decorative touch to any room. 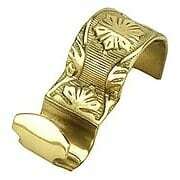 Reproduced in solid brass from a Victorian original, it comes in an array of classic finish options. 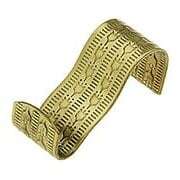 Imprinted with a delicate pattern of flowers and scrolls, this elegant picture rail hook resembles a band of grosgrain trim. Manufactured in solid brass and presented in our exclusive Antique-by-Hand finish, it ages gracefully over time into a beautiful natural patina. 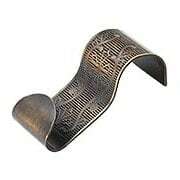 Imprinted with a delicate pattern of flowers and scrolls, this elegant picture rail hook resembles a band of grosgrain trim. 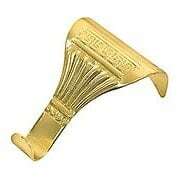 Manufactured in solid brass with your choice of 3 classic finishes.